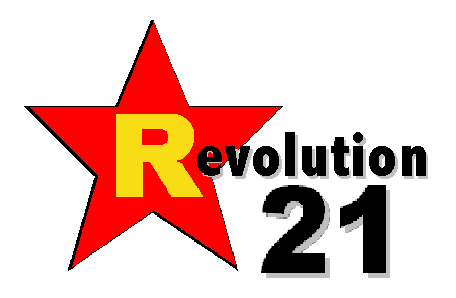 Revolution 21's Blog for the People: Oh, hail, no! I'm sure there must be at least a few reasons why someone actually might wish to live in the Texas Panhandle. This is not one of them. Those aren't boulders, and that's not a narrow grassy path through a lava field. That's four feet of hail, with a gully carved through it by the runoff from another three inches of rain. That's not something the Amarillo-area chamber of commerce will want to be playing up as it tries to attract new residents. NOT THAT anyone would believe such a thing -- even about Texas. Sure, everything's bigger in Texas. But 4 feet of hail from one storm? That's what the National Weather Service, the Texas Department of Transportation and a local sheriff say happened Wednesday in an area north of Amarillo when hail piled up in drifts so wide they cut off a major highway. The National Weather Service office in Amarillo even posted a photo on its Facebook page, but that wasn't enough to convince skeptics. "Serious do not think this is 100% hail!!!" commented one person. 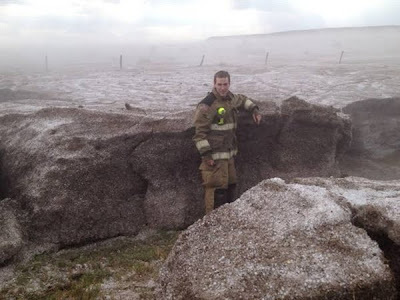 "It's a lite dusting of hail on some damn rocks," said another person, referring to the image of a firefighter standing next to what could be taken for boulders. "I can assure you we do not have big rocks like that in West Texas," Krissy Scotten, a spokeswoman for the weather service office in Amarillo, told msnbc.com. WELL, at least that's something.